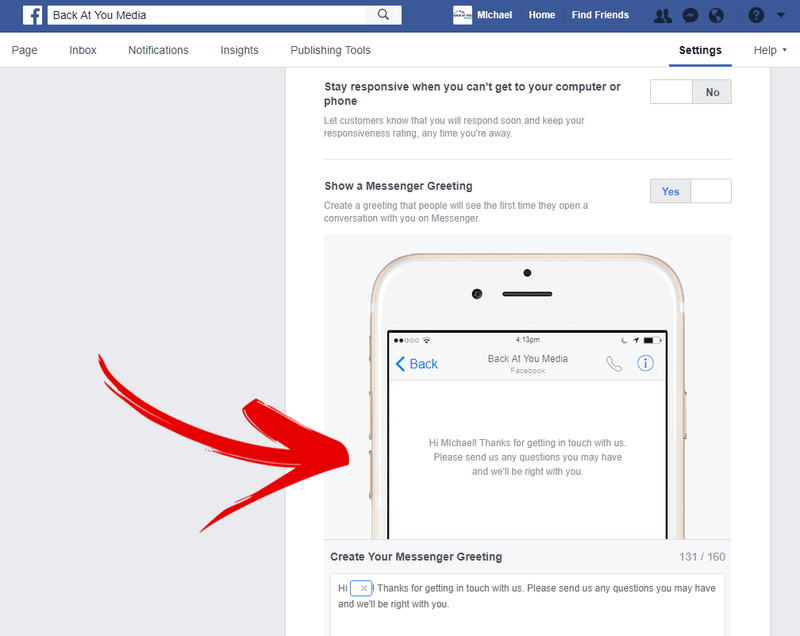 Facebook has many great features that allow businesses to communicate with potential and current clients, and a bunch of good ones live in the Facebook Messaging settings. You can set up everything from an auto-responder to away messages and even a custom greeting before people message you. Enabling this feature will automatically send a pre-written message as the first response to new messages sent to your Facebook Business Page. Common responses include letting potential clients know you’ll get back to them soon and/or thanking them for reaching out to you. Enabling Instant Replies is a good way to engage immediately (and automatically) with people who contact you. No one likes the feeling that their message has just disappeared into the ether and this auto-response will make assure the sender that you'll get to their message soon. Click Settings at the top of your Page and then click Messaging on the left. To customize your instant reply message, click Change, update the message and click Save. If you'd like an automated message sent when you're not on Facebook either on your phone or computer, you'll want to look for the setting that says, "Stay responsive when you can't get to your computer or phone." Click to change from "No" to "Yes" and click "Change" to customize. If you want to customize a greeting that people will see when they first open a conversation with you (even before they send anything), look for Show a Messenger Greeting. You know the drill by now, click "No" to change it to "Yes" and select "Change" to customize. Also in the Messaging settings, you have the option to enable a feature that will send a greeting automatically when someone opens a Messenger conversation with you, even before they send you a message. These greetings would likely be very similar to the Auto Response message, thanking the person for reaching out, saying you’ll respond to their message soon, or something of that nature. You may also enable the “Prompt Visitors to Send Messages” feature. By enabling this feature, while on your page, visitors will see prominent ways to start a message with you if your page responds to messages quickly or you’re online. These features are all designed to make the line of communication between you and the client that much smoother. We suggest you take a look at these features in your Facebook settings, even if you decide not to enable them.